Summer Loving, Had Me a Blast: If you're singing "Summer Loving" right now, you are awesome. If you don't know what we're talking about, go rent Grease and then come back. Are you back? OK, good. Photos have popped up online today of the cast filming what looks to be scenes from the big-screen adaptation of Grease, starring John Travolta and Olivia Newton-John (a previous Glee guest star). And they're filming at Venice High School, the same high school used in the film. By the looks of this photo (and others we've seen), we say Blaine is Danny Zuko and Sam is Kenickie. 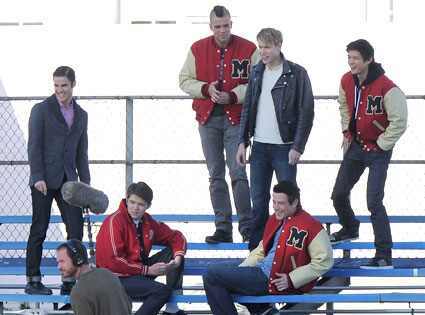 Kurt is missing from this picture, so does that mean he'll be the male version of Sandy? We love this. Now we'll be humming "Hopelessly Devoted to You" for the rest of the day. 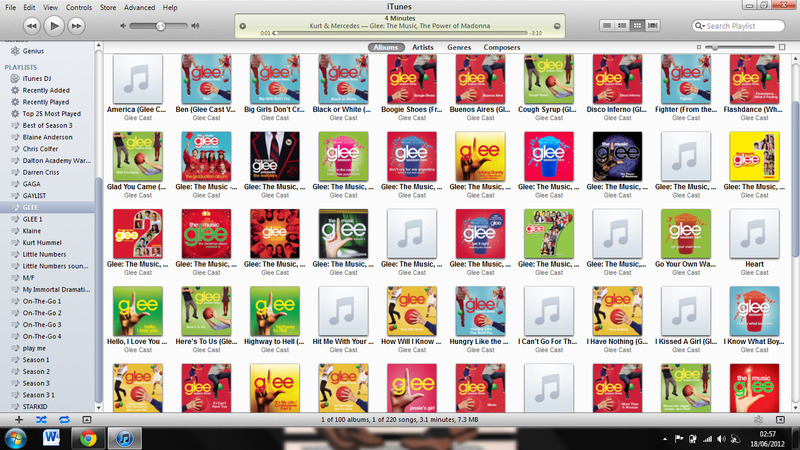 Don't Stop 'Til You Get Enough: Did you enjoy Glee's rendition of "Man in the Mirror" and "ABC"? Good, because there's a lot more where that came from. We've confirmed with Fox that Glee will be doing a Michael Jackson tribute episode, featuring 10-12 songs from the legendary pop star's library. According to TVGuide.com, shooting for this episode (set to air Jan. 24) will begin this week and after the winter break. Merry Christmas, Happy Holidays: Is it too much to ask that Glee cover *NSYNC's holiday ditty? But we digress. Of course we've seen the photos of Finchel and Klaine exchanging presents, but we wouldn't dare ruin the heart-warming surprise of what the gifts are. But we will say that, for the record, we like Finn's gift the best. I think that Sam is going to be Danny and sing it with Mercedes. Can't wait no matter what it will be! Sam is going to be Danny and Mercedes is Sandy. There is a video, in Tumblr, of the song where Sam and Mercedes sing the song ^^ check it!